The City of Annapolis 2009 Comprehensive Plan has been developed to chart the City’s direction for the next ten years. The are required to evaluate the and provide a 5 year update to the plan. A public hearing was held on Thursday October 2 at City Hall. The City Planning and Zoning acting head Dr. Sally Nash, presented the evaluation to members of the Annapolis Planning Commission, a citizen lead group that provides planning and zoning recommendations to the City. After the presentation, members of the public were invited to comment. There is a lot to like about the 2009 Comprehensive Plan. It very much indicates the critical link between land use and transportation and highlights the need for a walkable/bikeable, human scaled city which supports a variety of transportation modes, including bicyles. Indeed many of these ideas were further explored and solutions identified in the companion 2011 Bicycle Master Plan. The BikeAAA paper (download) highlights the limited bike related successes that have been implemented under the plan and points out the significant challenges ahead and where BikeAAA can provide assistance. For anyone interested in the vision for Annapolis, I highly recommend reading through the Comprehensive Plan, especially Chapters 3 and 4 on Land Use/Economic Development and Transportation. The compactness of Annapolis makes it ideal for bicycle transportation. A two mile radius circle encompasses the entire city including the Parole Town Center area just outside the city. We appreciate all the work that has gone into the 2009 Comprehensive Plan and the 2011 Bicycle Master Plan that will help make Annapolis a bicycle friendly city. There are many excellent land use and transportation ideas and initiatives outlined in the comprehensive plan. We ask that when the city conducts planning and importantly evaluating private development, redevelopment or city capital projects that it strongly consider safe and efficient bicycling, especially in the Outer West Street, Bay Ridge and West Annapolis/MD-450 areas where there are more opportunities for progress. 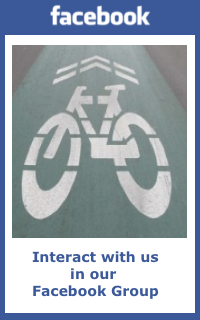 Part our mission is to assist local government in planning and implementation of cycling related facilities and projects. We are very interested in establishing a closer relationship with the City of Annapolis and working together to make Annapolis a bicycle friendly city. Since the city no longer has a dedicated Bicycle Coordinator, we encourage the City to utilize our subject matter expertise in the planning, review and implementation of private or capital projects. This entry was posted in Infrastructure, News and tagged Facebook. Bookmark the permalink.